The humble Eucalyptus tree, as Aussie as meat pies and beer, is as diverse as we are multicultural. Eucalypts contribute to a wide mix of local industries, from timber to artwork, for flowers and foliage and for the extraction of essential oils. The eucalyptus oil industry in Australia has ebbed and waned since the first commercial foray in 1854. It peaked during the war in the 1940s and is currently in decline, with Australia providing less than 5% of the world’s eucalyptus oil market. Before this decline, however, a few brave men decided try their luck in Canberra, setting up distilleries along the Murrumbidgee River and its tributaries. For some reason this was an industry that attracted migrants, mostly European, perhaps because language was not a barrier. However, the work was often lonely, physical and subject to environmental whims. The most prominent local setup was managed by a Czechoslovakian immigrant named Martin Tekel who ran stills from between 1938 and the late 1940s in various locations around Uriarra and Tidbinbilla. This find provides us with rare insight into both an historic Australian industry and a local venture in the 1930s. 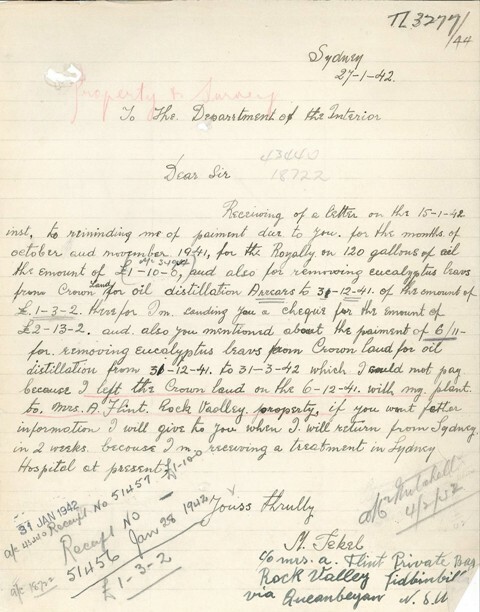 For this reason, papers relating to Mr Tekel’s business of removing Eucalyptus leaves for oil distilling are our February Find of the Month. The first known extraction of Eucalyptus oil was undertaken by request of the Surgeon General of the First Fleet in 1788 to find a suitable replacement for his dwindling stocks of peppermint oil. Samples were quickly sent to England, where eucalyptus oil soon became a preferred treatment due to its effectiveness with colicky complaints and its more pleasant taste. Despite this early success it wasn’t until the mid 1850s that the first Australian industry appeared in Victoria, with other states soon following suit. By 1940 Queanbeyan boasted a flourishing local industry, however, Canberra appeared to be trailing behind these other states. In 1938, a Czechoslovakian by the name of Simkovic started to research Crown land in Canberra for potential sites. Eucalyptus distilleries had not been functioning on Crown land for more than 25 years, and Simkovic’s interest was met with some enthusiasm by the Department of the Interior. Simkovic proceeded to traverse the area, preparing detailed reports on the suitability of the environment around Tidbinbilla and Uriarra. An experienced distiller, he sent samples from the different plantations by freight train to Victoria to establish their suitability and to enable him to choose the best possible site. The results showed that the local trees were below average for the extraction of Piperitone, an important component in essential oils, and on this basis Simkovic withdrew his application. In doing so, however, he recommended that his friend Martin Tekel be considered in his place. The area identified as suitable both by the Forestry Office and by Tekel was known as the Blue Range Ridge, located in Uriarra. This area was scheduled in two years’ time for clearing and replanting with Radiata Pines. It is easy to see why this business venture would generate enthusiasm. Tekel’s distillery would see the government make money for a task that it would otherwise have had to perform for itself. As well as paying for a permit, Tekel also paid royalties based on the amount of eucalyptus oil he produced. 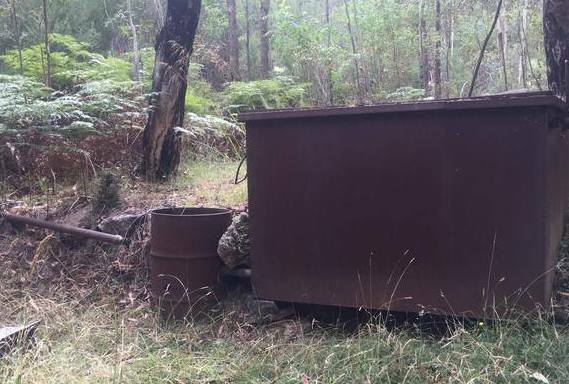 To decide the value of the business, the Property and Survey Branch sought advice from the NSW Forestry Commission and also took into consideration the poor sample results that Simkovic ordered to set a fair price. 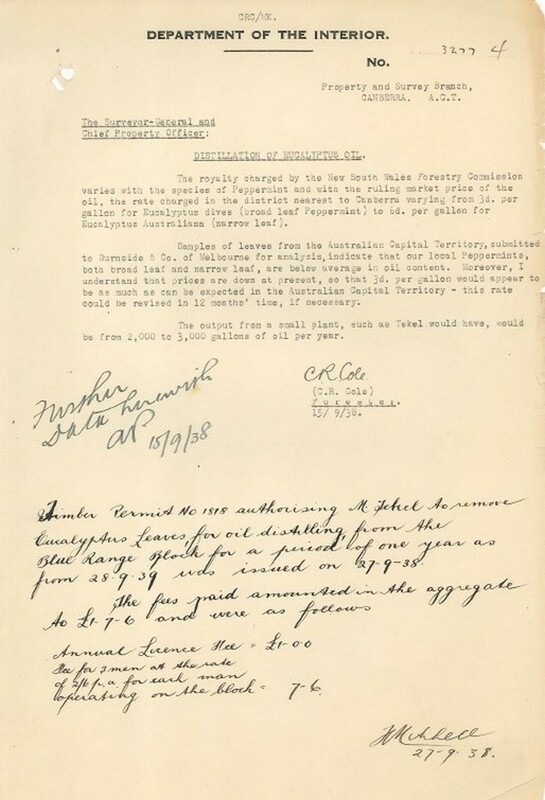 These additional costs may have influenced Tekel to move his distillery one year later, when he made private arrangements with a local freeholder by the name of Annie Flint and moved his distillery to a new location in Rock Valley, Tidbinbilla. This was to be the first of many moves by Tekel, who later relocated back to Crown land again. By 1941 he had already reapplied for a new lease on Crown land in Tidbinbilla described as “adjacent to the Western Boundary of the property of Mr H. Reid” and near Hurdle Creek. Both the price of the permit and the amount due in royalties were raised , but the constant moving made it difficult for the foresters to keep track of the distillery, and to prove whether the royalties were both accurate and being paid. Tekel employed two of his fellow countrymen for the duration of the business, Mr Steve Lajcin and Mr Jan Jandura Pucek. Eucalyptus distilleries often attracted European immigrants as they brought years of expertise to what in Australia was a relatively new industry. 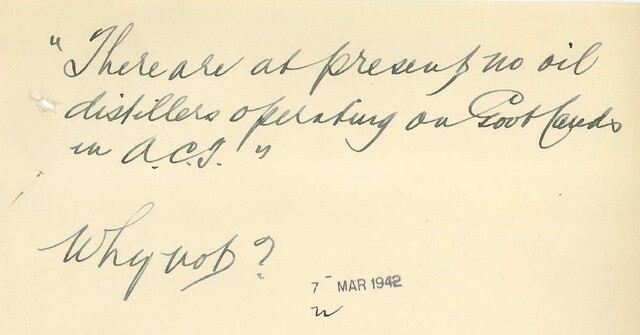 There is some evidence of communication problems on the file but by 1946 Tekel’s handwritten notes and letters show a fair command of the English language. This increase in proficiency may have been due to his and his colleagues’ relationships within the community. The three men often mingled with the freeholders of Tidbinbilla, and enjoyed the odd game of cards. In 1944, all married men aged up to 35, and all single men up to 45 were required to undertake militia training. 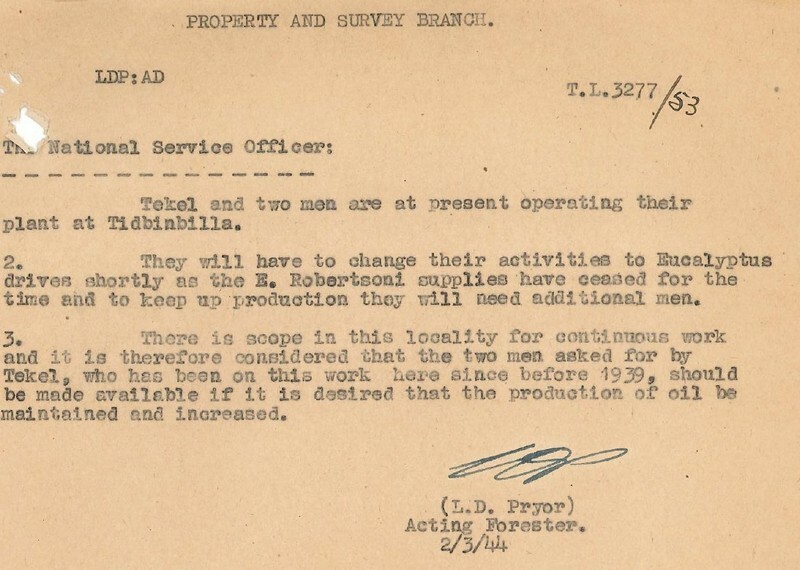 As eucalyptus oil was an important industry during the war the acting forester, Lindsay Pryor, wrote to the National Service Officer to exempt Tekel and his employees from the Citizens Military Forces. Although not much is known about Tekel himself, one of his workers, Mr Pucek was reported as being the first alien to become a naturalised Australian under the Nationality and Citizenship Act (1948). In 1999 a plaque was dedicated to Mr Jandura at the site of his old residence in Tidbinbilla with one of his remaining sons in attendance. Regardless of whether Tekel was operating on Crown or private property, he was still bound to strict requirements regarding fire measures. The overseer of the Uriarra Forestry Plantation was responsible for periodically checking the site to ensure that the site was kept clean and tidy and that fire prevention tactics were in evidence. In 1939 a ‘fire holocaust’ caused significant damage in Canberra, and whilst it may just be coincidence that this fire started in the Uriarra region, fire control was obviously a hot topic. 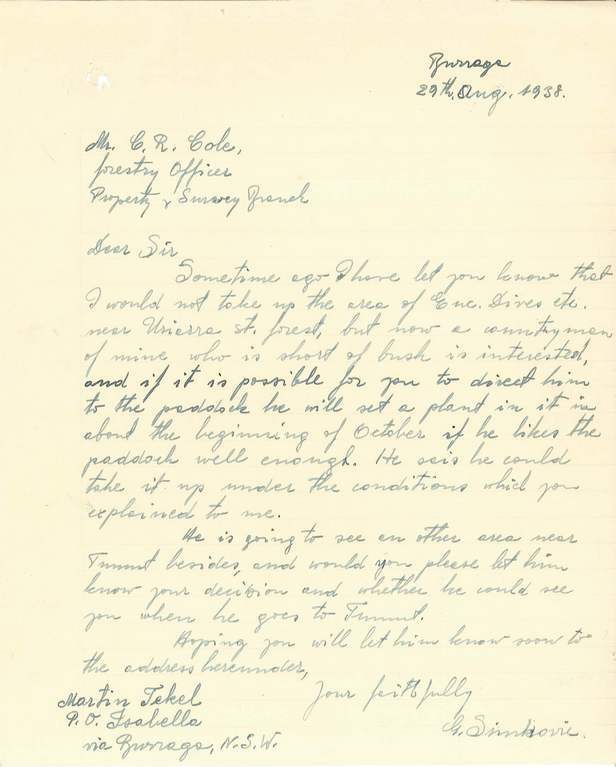 In 1940 a terse letter was sent from the Head of the Property and Survey Branch stating that ‘last year (1939) we had two fires from this source, costing a considerable amount of time and money to control them’. 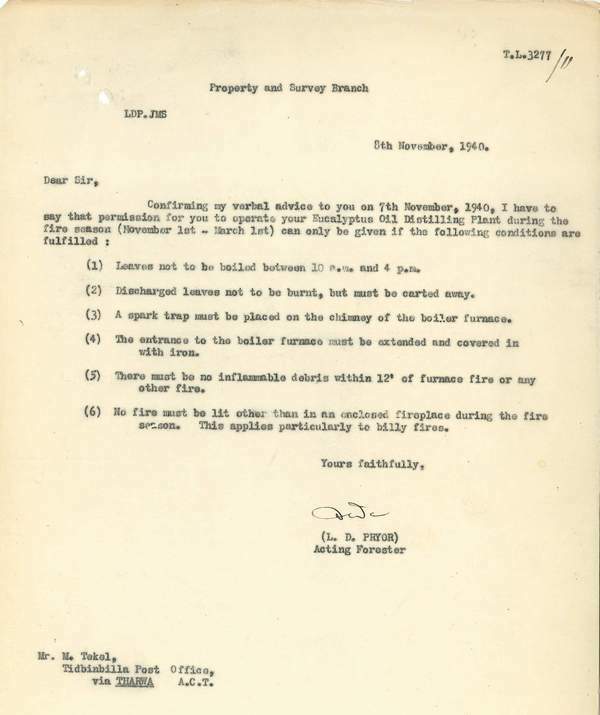 A list of demands based on the Bushfire Act(1936) was sent to Tekel accordingly. This would not be the first time that adjustments were to be made to the distillery. W. Cranswick, from the general store in Queanbeyan, wrote to the Department of the Interior in 1941, to clarify these requirements after being asked by Mr Tekel to quote on a second round of adjustments. It is probably safe to assume that these issues were resolved satisfactorily as Tekel continued to receive new permits until 1946. Martin Tekel, wherefore art thou? Archives ACT wishes to thank Rangers Tom Long and James Overall, and Mr Brett McNamara, from the National Parks and Conservation Service, EPSD, for their support in researching this FOTM. If you are looking for a family friendly day out, why not visit Tidbinbilla or Uriarra Crossing? 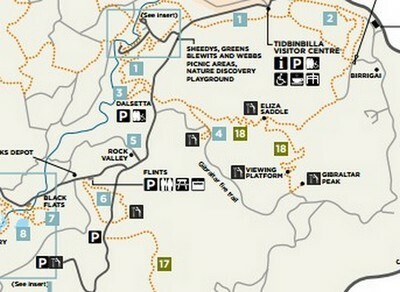 Visitor information can be found on the Uriarra Crossing and Tidbinbilla websites including: maps, facilities, ranger guided activities and walks of their relevant historic sites. 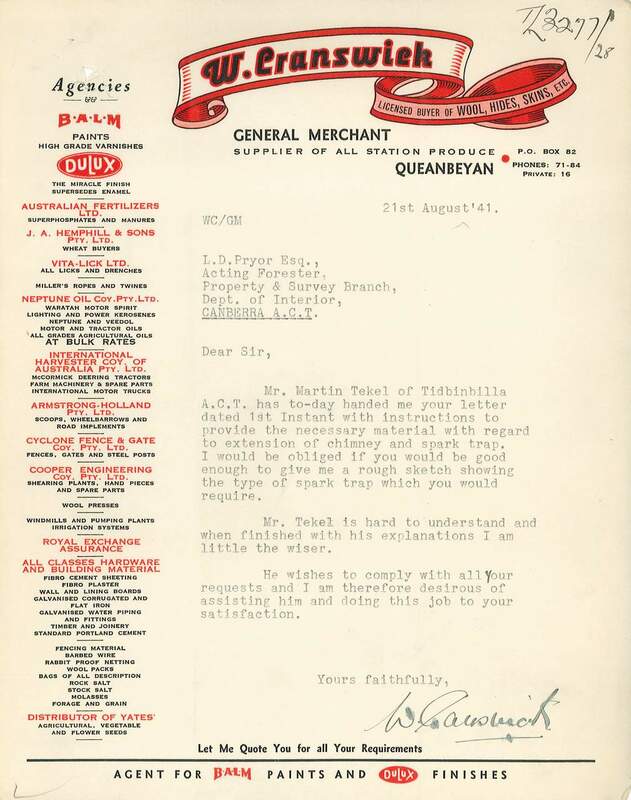 If you would like to learn more about the Eucalyptus Distilleries run out of Tidbinbilla and Uriarra in the 1930- 1950s please contact ArchivesACT through our “Request a Record ” service. If you would like to view the original documents you can also contact us to arrange a suitable time to visit the Archives ACT Reading Room located on the top floor of the Woden Library.